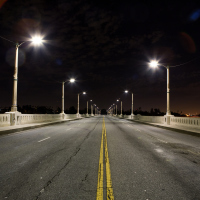 Exposure to the blue light emitted from modern street lighting can lead to an increased risk of breast and prostate cancer, according to researchers. A team of scientists used night-time images taken by astronauts on the International Space Station in order to evaluate outdoor levels of artificial light and compared that to health data from 4,000 people aged between 20 and 85. The researchers, led by the Barcelona Institute for Global Health (ISGlobal) and involving the University of Exeter, found the bluer the light emission that people in large cities were exposed to, the higher the risk of cancer. The study also found participants, who were asked to complete questionnaires about their indoor exposure to artificial light, who lived in homes with darker rooms for example by using window shutters, had lower risk than those who did not. Dr Alejandro Sanchez de Miguel, from the University of Exeter, said: "Humans have evolved to need light during the day and darkness at night. "As towns and cities replace older lighting, we're all exposed to higher levels of blue lights, which can disrupt our biological clocks. "It's imperative that we know for sure whether this increases our risk of cancer. "Scientists have long suspected this may be the case - now our innovative findings indicate a strong link." Older street lighting emits a glow within the orange spectrum but new modern LED lighting, which is more efficient and uses less power, creates a bright blue light emission. The study, which included people from in 11 Spanish regions, found that participants living in large cities with heavy exposure to blue lights at night had double the risk of prostate cancer and 1.5 times higher risk of breast cancer, compared to populations with less exposure to blue light. The researchers hypothesise that LED lights may disrupt the body's 24-hour cycle known as the circadian rhythm which in turn affects hormones. Both breast and prostate cancer are hormone-related. Dr Sanchez de Miguel said whether or not night-time exposure to the blue light emitted by smartphones and tablets increased people's cancer risk needed to be investigated. "We must now improve our research methods to ensure this is robust so we can advise on how best to protect human health," he said.